Farmers Market Pizza with cauliflower-almond flour crust at Pie Five Pizza Co.
An extra pat of butter here, a double dose of dressing there, and suddenly (and unknowingly) that restaurant meal has placed you firmly in a food coma. “Just think: When was the last time you tossed half a stick of butter into your pasta sauce?” asks Erin Thole Summers, a West Des Moines registered dietitian who specializes in sports nutrition. But chefs might do just that, since their priority is flavor rather than nutrition. All that typically adds up to a surplus of 200 calories per meal if you eat out instead of cooking at home. Tally that up once a day for a year, and all other things being equal, you’re looking at a bonus of 21 pounds. That isn’t just our assessment: Those who cook at home eat fewer calories, carbohydrates, fats and sugars, according to research published in the journal Public Health Nutrition. Still, it’s possible to cure your comfort food cravings without doing major diet damage. These dietitian-approved local swaps for your favorite restaurant recipes won’t leave you feeling one ounce deprived—or one ounce heavier. We’re not just talking about “diet plates” of cottage cheese and overcooked burgers or iceberg lettuce salads with a sad sprinkle of dry cheddar cheese. These vitamin-rich meals and snacks are full of good taste, thanks to fresh herbs, spices and naturally flavorful ingredients such as truffle oil, mozzarella cheese and, yes, even dark chocolate. Little is more satisfying come brunch time than an eggy English muffin topped with hollandaise. 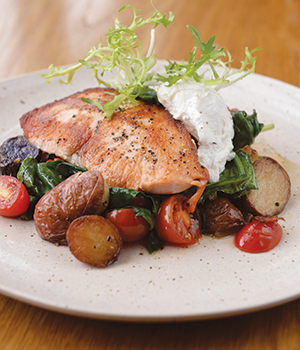 Australian-inspired downtown cafe St. Kilda designed an even more filling—and way more Instagram-friendly—fix with their grilled salmon, fingerling potato, spinach, tomato and shallot dish. The chef tops it off with a healthy drizzle of fruity olive oil. “St. Kilda’s salmon and poached egg entree packs in more omegas and vitamins compared to the buttery hollandaise and white-carby English muffins you’d find in traditional Benedicts,” Thole Summers says. By starting your day with this better breakfast, your heart is bound to be as happy as your stomach. “Consuming two 3 1/2-ounce servings of omega 3-rich fish each week, such as salmon, has been shown to reduce the risk of heart disease,” Heims says. Plus, the potatoes are an excellent source of potassium, a blood pressure-reducer that most of us get only half as much as we need (4,700 milligrams is the magic number) per day. St. Kilda, 300 S.W. Fifth St.
Savor three slices (half) of a Farmers Market Pizza from Ankeny’s Pie Five Pizza Co. for about the same number of calories as two traditional slices, while saving about 40 grams of carbohydrates. The slimmer swap is piled high with marinara, tomatoes, mushrooms, red onion, bell peppers, spinach and mozzarella and is a nearly spot-on substitute for regular takeout. 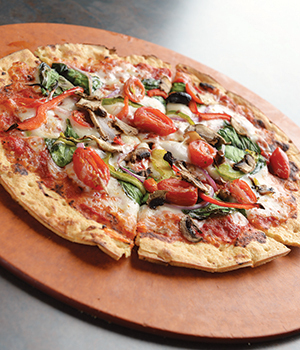 “Not only is the cauliflower-almond flour pizza crust lower in calories and carbohydrates, but it’s also gluten-free,” Thole Summers says. 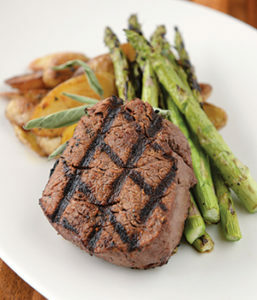 No one will be asking “Where’s the beef?” when this 7-ounce bison filet with truffle fingerling potatoes and grilled asparagus hits the table at Range Grill, an Urbandale golf simulator/restaurant. Red meat is never off-limits for Thole Summers. “I tell my clients: If you’re hungry for a steak, eat a steak. Just be mindful of the cut of the meat, the cooking preparation, and only eat until you’re no longer hungry,” rather than polishing off the entire 24-ounce porterhouse. Meat and potatoes fans rejoice: If you’re in the mood for tender filet mignon and roasted spuds, this entree will surely satisfy. As will the cast-iron skillet chocolate chip cookie you’re pretty much required to share after your virtual journey through 18 holes. Busy mornings sometimes mandate a grab-and-go lunch. But pick up a panini from a popular national sandwich chain and you’re looking at 750 calories and nearly a day’s worth of sodium, all before even thinking about dinner and dessert (because that’s a given on said jam-packed days!). Step inside Mercy Health and Fitness Center in Clive and you’ll discover Brightside Kitchen, a vegan cafe that’s home to a smarter sandwich. Made with buffalo sauce-coated chickpeas, tahini and leafy greens all stuffed inside a tortilla, this creation is a nearly spot-on stand-in for a buffalo chicken sandwich. Legumes also star in several of the cafe’s other options, from the chickpea “tuna” salad sandwich to the Brightside bowl of the day, a combo platter of whole grains, beans, slaw, veggies and dressings that’s sold in different permutations every 24 hours. Cure your sweet tooth without the crash—or the unpronounceable ingredients you’ll find in those cookie dough tubes—with this wholesome dessert that can be ordered online (thecutlerkitchen.com) and customized to your dietary needs. 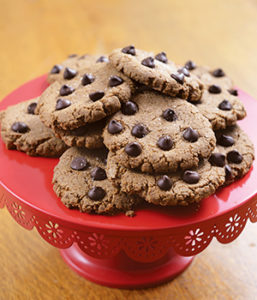 Made simply with almonds, coconut sugar, eggs, dark chocolate chips, baking soda and sea salt, these are among the “cleanest” cookies you can chew. “Eating dark chocolate with at least 70 percent cocoa will fulfill your chocolate craving in a nutritious way, with less sugar than most other chocolates,” Heims says. Plus, “the coconut sugar has a lower glycemic index than regular table sugar,” Thole Summers says, meaning you’re less likely to notice the blood sugar crash an hour later. Beyond personalized orders for pickup, you can find the Cutler Kitchen’s vegan goodies such as lemon cookies at Brightside Kitchen in Clive, plus a selection of nonvegan items, including maple raisin bites, at Dogpatch Urban Gardens and Horizon Line Coffee. Still hungry? Here are three more health-smart swaps for your go-to goodies. 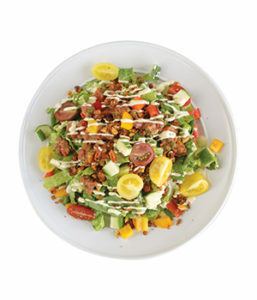 Order: Walnut “Meat” Taco Salad (pictured), leafy greens layered with tomato, bell pepper, cucumber, walnut taco “meat” and ranch dressing ($9), from the Grateful Chef. Nutrition info: 598 calories; 47 grams fat; 24 grams protein; 30 grams carbs. In addition to grab-and-go options including salads and soup, available Tuesday through Friday, the Grateful Chef (thegratefulchefdsm.com) offers a weekly menu of fully prepared, wholesome freezer meals for custom orders.